It was never really in doubt, and, at last, the EERC Dunlop V8 Supercar Challenge got under way with a double-header of 30 minute races. The eleven cars that turned out on Saturday all certainly looked the part, sounded glorious, and created great interest in the paddock, and among the spectators, one of whom, sadly, was Rob Compton, his 6.6 litre Vauxhall Astra still awaiting engine parts. “My head gasket’s stuck in customs,” he rued. Also missing, its engine blown, was Roger Etcell’s Peugeot clone, which Kelvin Burt will drive, but that still left a formidable array of machinery taking to the track for the 30-minute qualifying session – the first, and only, session there will be this season. Peter Seldon, in the BMW M3GTR, set pole, his 1:10.300 being set towards the end of the session, beating Adam Sharpe’s Ford Falcon by 0.289. 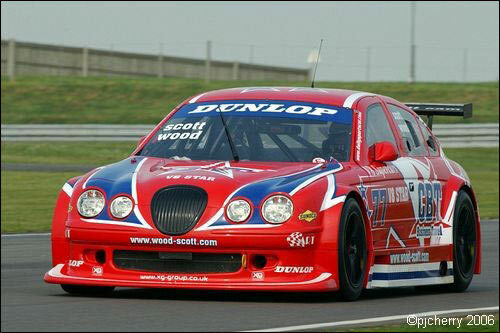 The stunning WSR / CBT Jaguar V8Star, Steve Wood at the wheel, was third, followed by Tim Hood’s home-built TVR Sagaris. A blown engine at the end of the session would mean that he missed the first race, however. 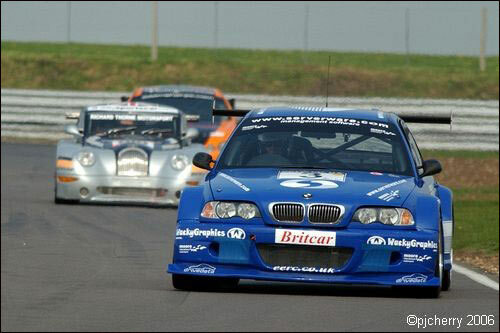 David Ellis was fifth in the Torquespeed re-engined BMW M3 (not “maxxed-up”, he and co-driver Mike Salmon were keen to point out), followed by Kevin Clarke’s Mercedes-bodied V8 Eurocar. 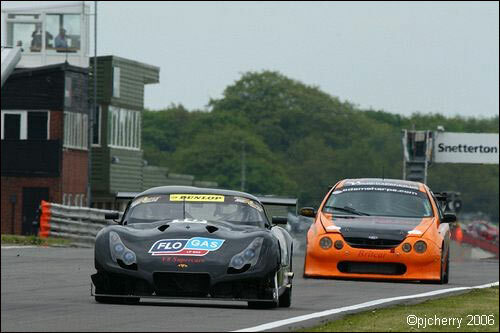 Britsports regular Howard Spooner was at the wheel of the glorious-sounding Richard Thorne Morgan Aero 8, TVR Challenge refugees Steve Glynn and Darren Dowling were very welcome in their Tuscans, and Alun Edwards’ Marcos Mantis (below) was in the hands of Jerry Hampshire. Late addition Dean Cook joined the back of the grid in his Tuscan. An extremely fired-up Seldon took the lead, on a damp track, at the rolling start of the first race, with Wood behind, and Sharpe seemingly cautious in third. Not for long, though, for, having passed Wood, he was closing in on Seldon (below), when, on lap three, the safety car was brought out to recover Kevin Clarke’s Mercedes. Once the race went green again, Sharpe found Seldon a tough customer, but passed him on lap eight, and began to pull away. Both, though, were struggling on wet tyres as the track dried out, searching out the puddles and wet lines wherever they could. David Ellis, in the Torquespeed M3 had pitted early for more appropriate rubber, and could now keep pace with Sharpe, eventually unlapping himself, and, later on, Hampshire brought the ISL Marcos in for a tyre change too. 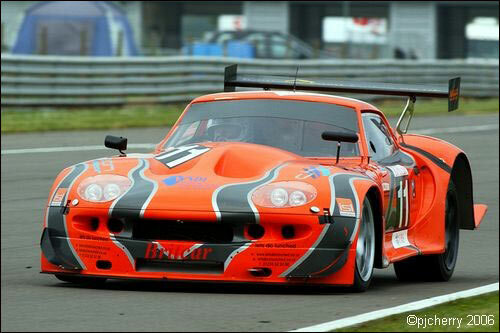 Sadly, Howard Spooner failed to finish in the Morgan. Sharpe took the flag, having completed 21 laps, with Seldon trailing by nearly ten seconds, with Steve Wood’s V8 Star Jaguar, closing in on a wet / intermediate mix, in third. The result of Race 1 set the grid for Race 2, but in reverse order, with non-finishers at the back. A slightly smaller field took the rolling start, Seldon’s BMW having expired in the previous day’s Britcar race, and Sharpe’s Falcon starting from the pit lane. All set, though, was Hood in the Sagaris, who found no problem in negotiating his old Tuscan mates as he rapidly made his way through from the back. Steve Wood found the three TVRs less accommodating, however, and once through, had Sharpe breathing down his neck. The 500bhp Jaguar was (literally) powerless to hold off the 650bhp Falcon though, and Sharpe then set about catching the flying Hood. The pursuit came to an end just after the half-way mark, Sharpe crawling round Coram, onto the grass at Russell, and into the pit lane. “We’ve had a blow out, we’re retiring,” was Robert Sharpe’s gruff announcement, and, with the red flag brought out after 25 minutes because Steve Glynn’s car had stopped out on the circuit, Tim Hood took the win in the Sagaris. A series for V8 Supercars has been on the cards for several years, and now it has happened. There were a lot who desperately wanted to be there, but couldn’t. Come the next event, in August, the word will have spread.